Little hand on the hours, big hand on the minutes. Everyone knows that. Now, what if you only had a single hand on that watch? One-hand watches rely on an hour hand alone to indicate the time. Once you wrap your head around the concept and relax your notions of split-second (or even split-minute) time keeping, it starts to make sense. A long hour hand read against a detailed index will provide more than sufficient accuracy. How do you answer the question, "what time is it?" If you are likely to say "precisely 10:13 and an half" then maybe you should stick to a conventional watch. If you would say, "about a quarter after" then a one-hand watch might be for you. If you are ready to give one-handing a try, I have five suggestions. 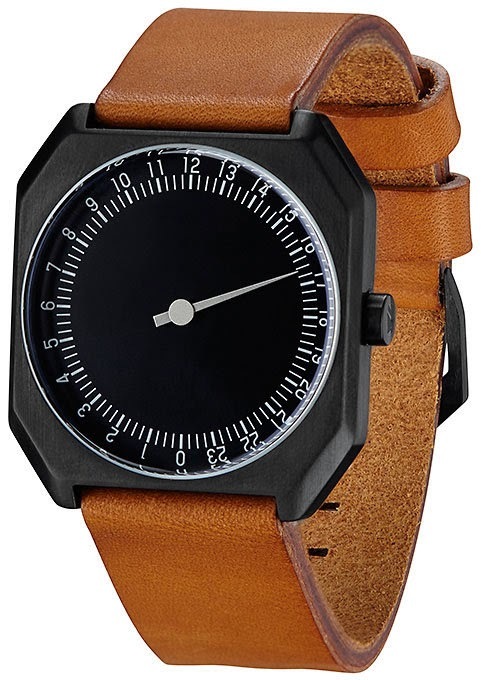 Luch watches are made in Minsk, Belarus. They offer a very inexpensive one-hand model using a 15 jewel hand wound movement. The watch is 36mm wide with a 20mm strap. This is a no-frills piece: chrome played case, printed dial, no lume, and of course, only one hand. The 12-hour dial with its two digit numerals and single, needle-like hand give it the appearance of a mechanical instrument gauge. The chapter index is delineated in 5-minute increments. There are various case and color combinations available, but I would choose a silver case and white dial with the attractive Cyrillic logo. Luch does not sell watches directly from thier site, but new ones are easily found on eBay. Prices range from $47-$60, depending on style. Hong Kong boutique SquareStreet offers the Minuteman One Hand. The Miyota quartz movement is shielded inside a stainless steel pressure case, which is itself nestled in a 40mm, molded Mazzuchelli acetate (fancy plastic) case, giving the watch 30m water resistance and an attractive shiny shell. The dial has diminutive two digit numerals in a radial layout, presenting a wide expanse of negative space inside the dial that is broken only by the single hand and a date window at 4 o'clock. 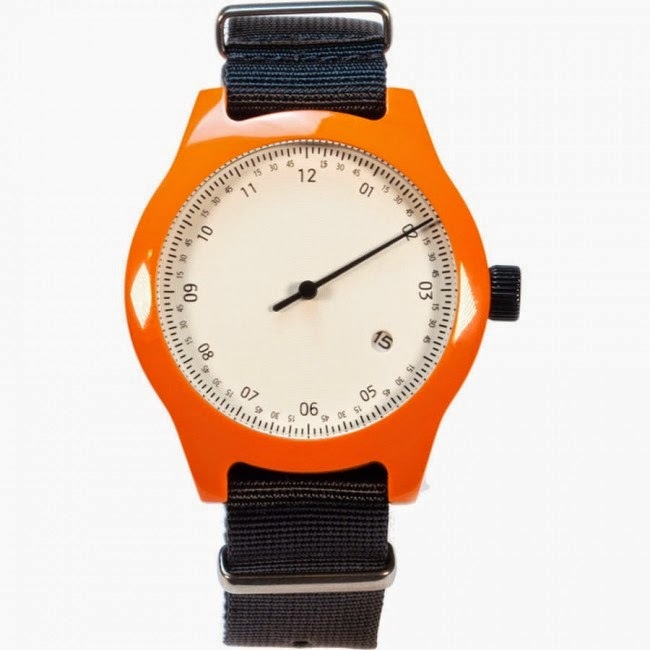 I like the off white dial in the lurid orange case with black NATO strap and black crown for $175. 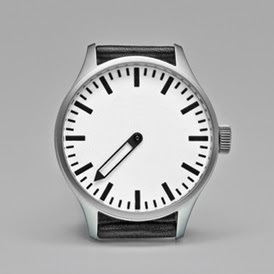 It just looks cool, probably because it was designed by David Ericsson of Void Watches and Alexis Holm of Gram Shoes. 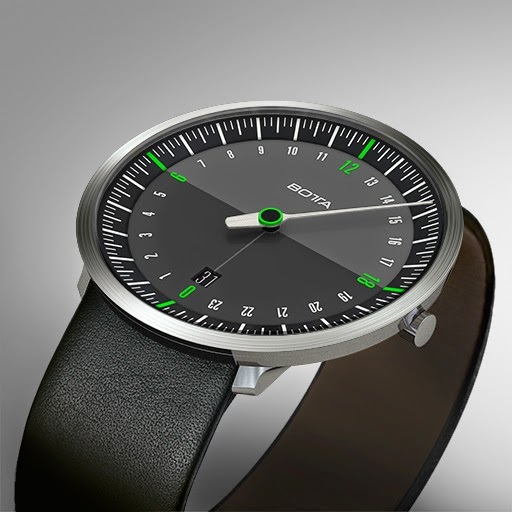 German watchmaker, Botta Design, has a full line of single hand watches. The UNO 24 Neo models are lovely little units, just 40mm wide and a scant 6.8mm thick with small lugs on slim calfskin straps. The index is angled down towards the dial, creating a slightly dished effect. The dial exhibits typical one-handed minimalism, but with splashes of color at the center and one-quarter positions on the face. The hand is a slender needle with a broad tail. Most intriguingly, the dial is shaded differently from top to bottom, to indicate day and night. A date window appears at the 6 o'clock position, which is actually 0 or midnight on this dial. The Time Bum's choice? The black/green Special Edition going for $450 at Twisted Time. Ickler designed Defaktos like the Inkognito Afterglow One Hand Automatic12-hour one hander for a certain kind of watch nerd, but not for all of them. In the words of its designer, "my target was not the conservative watch enthusiast who gets pissed if the clock is late by one second every day." Perhaps ironically, it is powered by the highly accurate ETA 2824-2 automatic movement. The luminous white dial is bold and graphic with thick stick markers in 15-minute increments and no branding. Unlike the others, the hand is a broad, skeletonized pencil shape. It is 42mm wide with 50m water resistance, sapphire glass, and a display case back. Because there is nothing on the watch to indicate top or bottom, it can be worn on either wrist simply by reversing the position of the strap. You can buy direct for 460€, or US buyers can find them at Watchismo for $699.99.